Yes, I do have photos of her alone and with the other pigs. I'm brand new to this site could you tell me how to upload them? 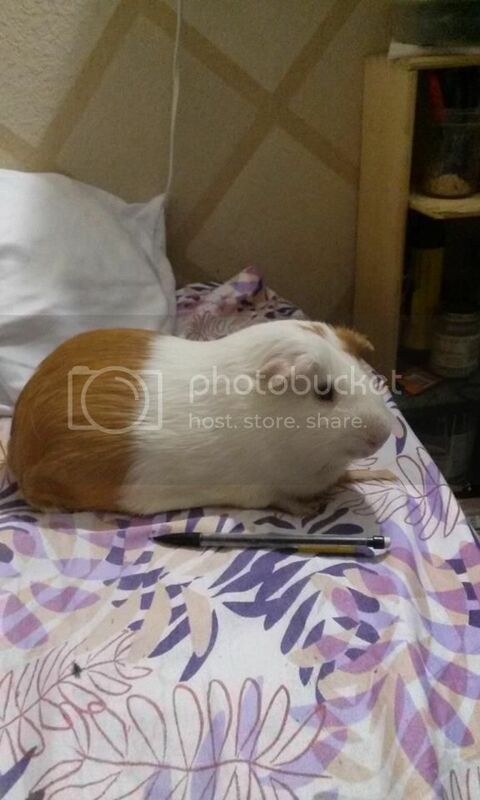 Maxwell is a male cuy that I picked up from a local shelter in December, 2014 as a 3 year old. He topped out at 2800 grams. He was definitely a cuy physically, but his personality was more like a lap dog. He was calmer, sweeter, gentler, more outgoing than almost any piggy that has come through our rescue. If you stopped scritching him before he was satisfied, he'd nudge you for more. He broke the cuy mold. But Maxwell seemed to pick up contagious bugs when none had been around for a while. He picked up CL and battled it for around 4 or 5 months before we finally had the lymph node removed. He also picked up fungal infections and a URI when there had been no cases in a year or so. His cagemate was with him through all of this and stayed totally healthy. In talking with a couple other rescues, they noted that several of their cuy end up with CL too. The cuys we've had have been more susceptible to it. I sadly have to have Maxwell euthanized yesterday due to a large tumor or abscess in his jaw that rapidly misaligned his jaw. Even syringe feeding him 4 hours a day wasn't enough to maintain his weight. I just wonder if cuy's immune systems aren't as tough as other piggies. Sorry about Maxwell. What a joy it must have been to cuddle a 2800 gram pig. Seems he lived longer than some of the other cuy we've heard about? Yes, he did last longer, if I can believe what the shelter told me. 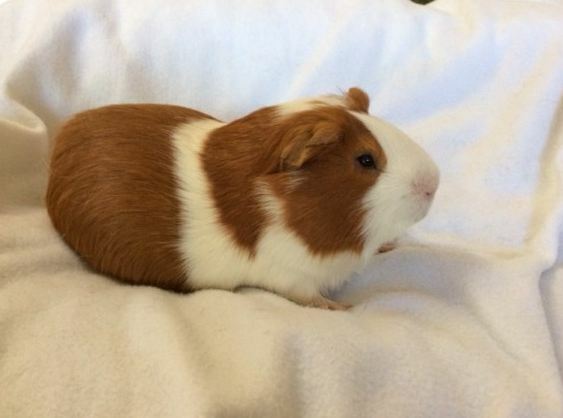 I also have a 5 year old female cuy named Billie Jean that I've had for almost her whole life. She survived pyometra and being spayed a year or so ago. So there are Cuys lasting longer than a few years. I'm so sorry about Maxwell. He sounds like he was a sweet guy. Sorry he had to deal with all these issues. I've found that the two female cuy here have dandruff issues. I thought it was mites but they've been treated several times. lisam, you probably know to try treating the "dandruff" as fungus. I've never heard of treating "dandruff" as fungus. Maxwell had very flaky skin, both before and after his fungal baths. Is flaky skin considered a fungal issue? "However, the real cause of dandruff is actually a yeast-like fungus, Malassezia globosa, which lives on your scalp, feeding on skin oils." "A very common fungus called malassezia may contribute to dandruff." "A yeast-like fungus (malassezia). Malassezia lives on the scalps of most adults, but for some, it irritates the scalp. This can irritate your scalp and cause more skin cells to grow. The extra skin cells die and fall off, making them appear white and flaky in your hair or on your clothes." My teddies appeared to have dandruff. After a bout with ringworm, for which everyone got Malaseb baths, the dandruff was gone. Doesn't mean that all flaky skin is fungus, but it's a possibility. Temperament: Enjoys being petted, hates being picked up. Also can jump approximately 2 feet high. Two of my cuy have passed away this month--one at the start of August and the other two days ago. Both just stopped eating. Couldn't find anything wrong. I hand fed them and they were on antibiotics. Hazel seemed to recover and was eating normally, but a week later was gone. Ollie just never started eating on her own, and I found her dead. I don't know how old either was. Hazel had been in a few homes before she came here. Ollie had been here for 18 months. Sorry to hear about your cuys, Lisam. skittish, but loving once caught. He's getting better at it, too, occasionally approaching my hand just to be petted. some ringworm at the time I got him. A small cyst on his back six months later. Shedding hair near year round, and possibly terrible eyesight,(even for a cavy,) which contributes greatly to his skittish nature. I am so proud of how far this boy of mine has come. When I got him home, he was so scared that he wouldn't eat even lettuce, didn't know what the heck hay was, and was fully capable of easily clearing the foot tall cage I had him housed in. I'm not sure how old he is, or what his background was, but I'm ok with that. He's a great companion, once you convince him that you do not, in any way, intend to harm him. He most definitely doesn't trust his eyes much, he mostly sniffs and listens hard. It's been at least a year and a half of patient handling, and his personality is finally showing. He likes most veggies now. but still hates tomatoes with a passion--that face he's making? I gave him a cherry tomato just before these series of pics. He still eats them, though. He is awfully cute. I'm glad you gave him a loving home [correction] and that you are a master of patience. Last edited by Lynx on Mon Sep 12, 2016 8:51 am, edited 1 time in total. I aim to spoil all my piggies rotten, too. I just felt his manudium today, and it feels odd. ( I don't usually pet piggies there, as they don't like it.) But with him, it's like it's jutting out a bit further than it does in my other piggies. Perhaps a birth defect? It would explain his unique sound. It's manubrium, and it's part of the breastbone.